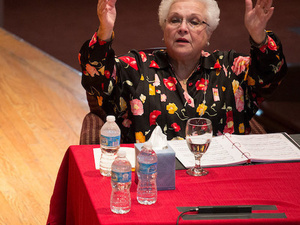 Heralded mezzo-soprano Marilyn Horne returns for her annual master class offered as part of the Oberlin College Artist Recital Series, featuring performances by outstanding Oberlin Conservatory voice students. Free for ARS subscribers and OCID. *Admission by individual ticket. Tickets can be obtained through Oberlin College Central Ticket Service (CTS) at 440-775-8169 or 800-371-0178. The distinguished professorship of voice is made possible with the generous support of Stephen Rubin through the Marilyn Horne Professorship and Residency Fund. This master class is presented by the Conservatory of Music at Oberlin College in association with the Marilyn Horne Foundation.